Minerals are natural substances that are absorbed by your baby’s body through food and other supplements. They are necessary for many bodily functions, particularly the growth of your child. Minerals like chromium, copper, iodine, iron, selenium, and zinc are called trace minerals because you only need very small amounts of them each day. Help her stay awake and calm while she eats. It’s better, over the long run, if your baby doesn’t go to sleep while she’s eating using eating to fall asleep wont help her learn about being full or putting herself to sleep. Eventually you will want her to be able to sleep well. And going to bed drowsy but still awake will help her learn to do that. Help her to stay awake during feeding by holding her close enough so she can see your face. Talk with her gently while she eats. Eating variety of foods is good for your baby, while keeping her calm will encourage a good feed and sleep habit. Snacks are an essential part of meal planning and need to taken just as seriously as meals. Planned snacks, not food handouts. Planned snacks are intended to prevent and make you resistant to food panhandling. 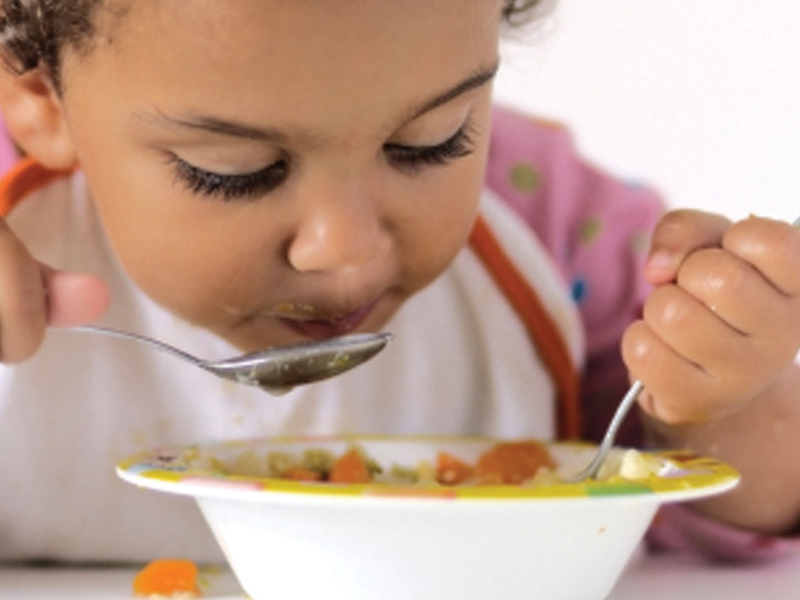 Consider this scenario: Your toddler gets down from the table having eaten little or nothing. Five minutes later she is back begging for a biscuit. If you know she has a snack coming in a few more hours you will be more likely to say a firm no than if you think she has to wait for the next meal before she can eat again. In planning meals for your family, it is best to treat your child like you do everyone else – sometimes she gets lucky and sometimes someone else does. Don’t limit your menus to the foods that you know your child likes or she won’t learn to like the whole world of other foods. She is growing up to join you bat the table, you arte not learning to eat off the high chair tray. An alarming meal like livers, boiled potatoes and boiled cabbage may be a sadistic mean. A more sympathetic meal would be liver and bacon, mashed potatoes, corn and of course bread and milk – and letting your child choose and pick from the menu what she can manage. It may take her years to start eating liver, but her chances are pretty good that she will – if you like it. This entry was posted in 3-6 Months, Baby, Feeding and tagged Solids.